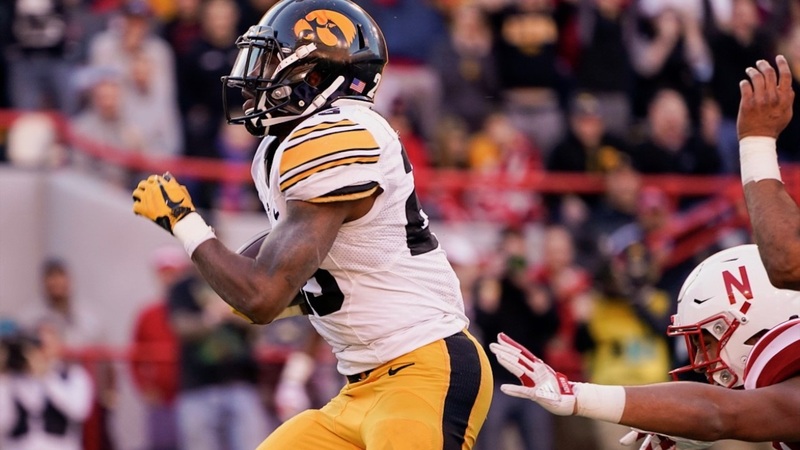 Nebraska got on the board first thanks to a special-teams miscue from Iowa. Hawkeyes punter Colten Rostetter fumbled the snap following a three-and-out setting the Huskers up at Iowa’s 15-yard line. Two plays later, wide receiver Stanley Morgan Jr. made a spectacular one-handed catch at the back of the end zone to give Nebraska a 7-0 lead. The Hawkeyes methodically answered with a 15-play, 99-yard touchdown drive, the final play a 20-yard run up the middle by Akrum Wadley. Nebraska defensive tackle Mick Stoltenberg, who was giving the Hawkeyes’ offensive line fits in the middle with four tackles and 1.5 tackles for loss over the first 10 minutes, went down with an injury and was helped off a few player earlier. Stoltenberg’s day was done. Nebraska regained the lead with a little over 6 minutes remaining in the second quarter on a 28-yard touchdown pass from Lee to Morgan. The catch gave Morgan 967 yards on the season, breaking Johnny Rodgers’ record for single-season receiving yards (942) set in 1972. The Huskers looked to gain some momentum following Morgan’s record-setting grab, forcing a three-and-out on the ensuing drive. But Nebraska was flagged for running into the kicker on the punt, and Iowa made the most of its second chance. Wadley broke free for a 29-yard run on the next play, and six plays later the Hawkeyes tied the score right before halftime on a 4-yard touchdown pass to tight end Noah Fant. It was Fant’s ninth touchdown on the season. The nothing-special day for special teams, both ways, continued in the second half as Iowa returned the opening kickoff for a touchdown, only to have it negated by a late block in the back. The penalty only set the Hawkeyes back to the Huskers’ 22, however, and a five-play drive ended with a 1-yard touchdown run by Wadley to give Iowa a 21-14 lead. The strain was just beginning for the Huskers. Following a Nebraska three-and-out, Iowa needed just two plays, a 44-yard pass to Fant and a 12-yard touchdown run by James Butler, to make it 28-14. Two plays after that, Lee threw his 14th interception of the season to give the Hawkeyes the ball back at Nebraska’s 40. Wadley covered those 40 yards in two carries for his second touchdown of the day and Iowa’s third in the first 7 minutes of the third quarter. There was one more third-quarter twist of the knife left when Fant, an Omaha native, had a 68-yard catch and run to make it 42-14. The Hawkeyes outgained the Huskers 209-59 in the third quarter. Fant led all receivers with 116 yards on three catches. Morgan’s record was one of the lone bright spots on the day. He finished the day with seven catches (on 16 targets) for 74 yards and two touchdowns. That left Morgan 14 yards short of becoming Nebraska’s first official 1,000-yard receiver. Lee, with two more interceptions in the second half, finished the season with 16, the same total Tommy Armstrong Jr. had in Mike Riley's first year in Lincoln in 2015. The loss dropped Riley to 19-19 over three seasons at Nebraska.